What do you get when you mix a couple sticks, a few rocks, and two buckets of soapy water? Hours and hours of simple, wholesome entertainment!! Seriously, my girls played in these buckets for hours! 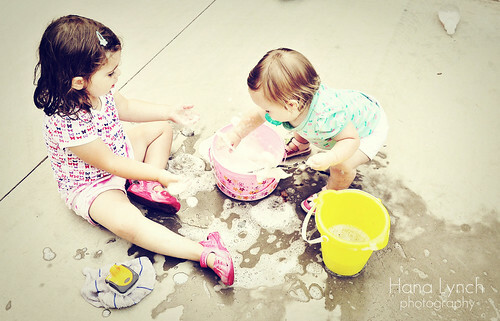 Halle was completely engrossed in washing the rocks and stones she collected and Ella was content splashing away! Who would have thought these few simple things could bring so much joy to two little girls? What a great idea! I might have to borrow it this afternoon. Great shots of your adorable girls. How fun! Those are great pictures! And by the way, I have picked your blog for a blog award - go to my blog to check it out http://southerngirlflorals.blogspot.com/. A little PW 70's action? Oh what a fun time! And such sweet pictures!!! !